We started out building something for the house, but soon learned that the wife had other ideas for the space. So we finished the project and came away with a terrific, but unsuitable (for us) piece of furniture. 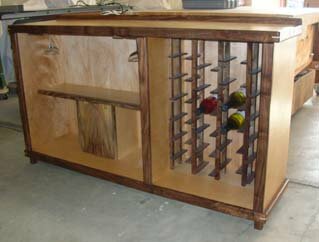 Constructed of 3/4-inch birch plywood and trimmed with 3/4-inch California black walnut, this wine cabinet really catches the eye. There is a wine rack and room to hang a half dozen glasses. 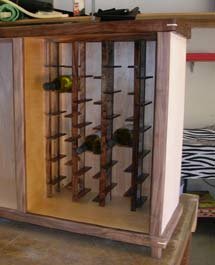 For that special bottle, a center compartment made of English walnut provides cover behind two doors with a rare earth magnet latch. 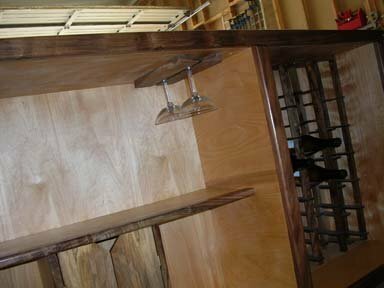 The long shelf is trimmed with English walnut and will not sag, even after many years of use. Finished with multiple layers of polyurethane, you can expect many years of service from this cabinet. A small back edge on the top will catch wayward items before they fall behind and out of reach. The top itself is reinforced, measuring 1 1/2 inches thick. 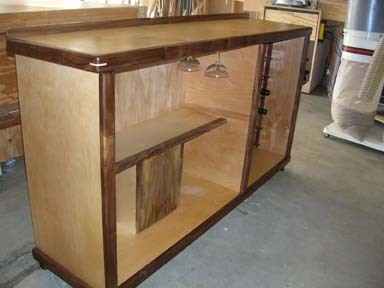 The staggered bottle rack is made of sturdy walnut. This unique design allows for full ventilation and easy-read labels without disturbing the bottles.